Trailing Hardy Winter Pansies ?Cool Wave? 'Cool Wave' is the latest breeding breakthrough. A pansy that the breeder is calling The Best Trailing Pansy Ever! Quite a claim but we think so too! This amazing large-flowered series keeps flowering all winter long, and well into summer too. It is very hardy (to around -25C! ), so it will withstand the worst of the winter whatever the British weather throws at it, producing endless waves of simply gorgeous flowers in shades of golden yellow, violet, mauve, berry purple and white - for nine whole months of the year - hence the name 'Cool Wave'! They will cascade over the sides of hanging baskets and planters, providing a splash of zingy colour in the dull days of winter. 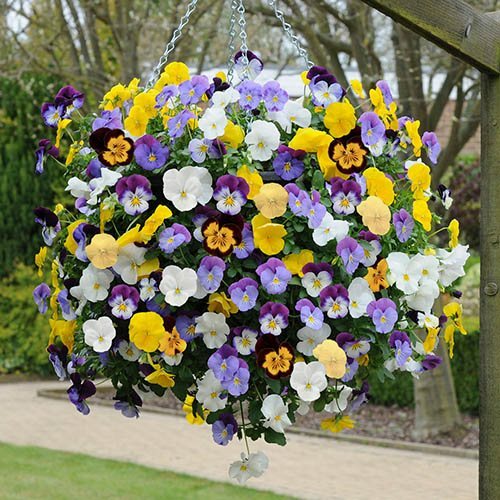 Smothered in big, traditional pansy flowers, this vigorous trailer is set to make its mark on gardens everywhere - it's a real breeding breakthrough for much better performance in hanging baskets. The BEST trailing pansy! Fill up easy fill baskets with these hardy pansies and you'll get an astonishing display of colour.